i'd then suggest you take a look at the latest Gameinformer Show and Podcast Beyond where they discuss the problems with the game and why they could not give it 100% like EZA have done. Why should I care about this and how is this relevant? That's the people of Game Informer's opinion. Are you telling me that whatever GI says is somehow objective truth or something? Are you saying that Ben's opinions and experience is wrong because you or GI says so? Using your logic I can ask you to present some games you'd give a 10/10 and then I'd come up with criticism to "prove" why those games cannot be 10/10 and that your opinion is wrong. Why? Because I say so. You don't understand what a review is. A review is not math where you add or subtract points based on objective facts to land at a correct number. The reason you should read or watch a review is to get a better understanding of a game so you can make an educated purchase. The more reviews you read the better your understanding will be. and those problems they talk of is why the game is not a worthy 5* review. as i say EZA will not be a trusted review source for me when they fail on the obvious. There is not a single reviewer that should be viewed as "trusted", not even Game Informer that you bring up. Do you know why? Because everyone has different opinions. You seem to think that reviews can be right or wrong, which simply isn't the case. You should remember this for the next time you disagree with one of your "trusted" reviwers. I mean if I don't have problems with the controls in game X but someone else does, who exactly is right here? Can you tell me that? Then can you tell me why said person is right and the other is wrong? But hey, you do what you want. No point in continuing this discussion for several reasons, one of them being that it's off-topic. @yungstar Just removing the extra 2 posts that were essentially duplicates. If you're more into how a game performs and feel like that should affect a review score in every instance that's totally fair. However I really think you're looking far too much into the actual score and not the content of the review itself. Bloodworth believes the game is a masterpiece for him but he does say in the review that it has technical problems. Seems to be all the informaton that's needed. They say in the concluding paragraph of the EZA review that the game is not in fact perfect. I believe you're too torn up on the score. All criticisms were laid out and presented just as the GI review. However, the EZA critic did not feel like those problems took away from its "Masterful" status. They still outlined how the game plays and operates, and present the viewer with a better understand of the game (which is exactly what a review is supposed to do). @yungstar Even though in this case GI and IGN had significantly lower scores, you have to keep the difference in scales in mind as well. IGN uses a full 100 point scale. Game Informer uses a 10 point scale with .25 increments. At Easy Allies, we've decided to use a much broader scale - 5 stars with half-star increments. This was done for several reasons, but one of those was the fact that at GT, it felt impossible for any game to reach a full 10. There's always some small issue that would get in the way of that and reserve our judgment to something such as a 9.6 or a 9.8. A half-star is a huge chunk of the scale. This isn't a rule by any means, but for the sake of comparison, I'd say 5 Stars would apply to most games we gave a 9.5 or above at GT. We still intend for 5 Stars to be somewhat rare, but we don't think it's out of the question to see a couple each year. 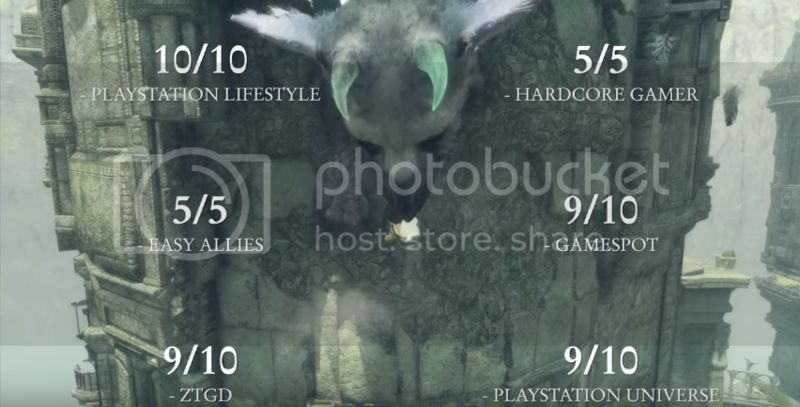 As others mentioned, I didn't gloss over The Last Guardian's flaws, I acknowledged them and communicated them. Some of the portrayal others give to its flaws I don't connect with at all. I had a couple of minor annoyances from time to time, but nothing that felt like a significant detraction from the overall experience of what I feel is a historic game, quite unlike anything that's come before it and perhaps anything after it as well. This is the first time I've given 5 Stars. I never gave a 10 at GT, and I only gave one 10 at Nintendo World Report. For someone who's been writing about games for 22 years, I think you should reflect on that before simply writing off whether you trust my reviews. We can certainly disagree on the score and the importance of its flaws, but I think if you look at the content of my review, you'll see that everything you need to know has been communicated. I am very dumb when it comes to numbers. What is the difference between 100 point and 10 point systems? Wouldn't both be 100? Or do the increments of .1 vs .25 mean something more important than I realize? Again, math, numbers... not my thing. @GoTaco the increments are the difference. IGN uses every number on the spectrum. So a game could go between a 7.8, a 7.9, to an 8.0. While Game Informer can go 7.5, 7.75, to 8.0. Then for us, we go between 3.5, 4.0, and 4.5. So basically with a larger scale, you're not splitting hairs so much. @suplextrain Exactly, reviews are in the end opinions with different perspectives. You should read many different reviews if you want a broader more accurate idea of a game. Just watching EzA you only get to see one side so looking at other reviews on top of them is beneficial. But saying a reviewer "will not be a trusted review source" because it was different than another reviewer is absurd. I could say the opposite, stating that GameInformer is no longer a trusted reviewer because they gave a lower score than EzA. There are many different reviews out there and you can't say one is wrong. And as Blood pointed out their scale is vastly different than the others, which I love! In the end their reviews are less about some score that part of you just wants to scroll down to see without reading the content of the review. The actual scoring is fairly broad, masterful doesn't mean perfect and a 3/5 decent doesn't mean there is no value (which a lot of people might think if they see a 60/100 as a score). GUYS LOOK WHAT I JUST FOUND! I think EZA should be proud that of all the publications they could have put up, they have Easy Allies who are under 1 year old. You guys have put this brand out there and people are respecting it because they respect the Allies. It isn't like this is some big budget production at the moment. Somebody at Sony likely knows your work. It's all uphill in 2017!